SSMU election season ended March 29 with the release of the results for executive positions and referenda questions. Voter turnout for this election was 18 per cent, or 3,944 out of 21,842 potential voters. Last year’s turnout was 32.8 per cent; however, most positions and fees had abstention rates between 30 and 40 per cent. The item with the smallest level of abstentions (6 per cent) was the Policy on the Implementation of a Fall Reading Break. This policy, high-profile in nature, was a draw for many voters. 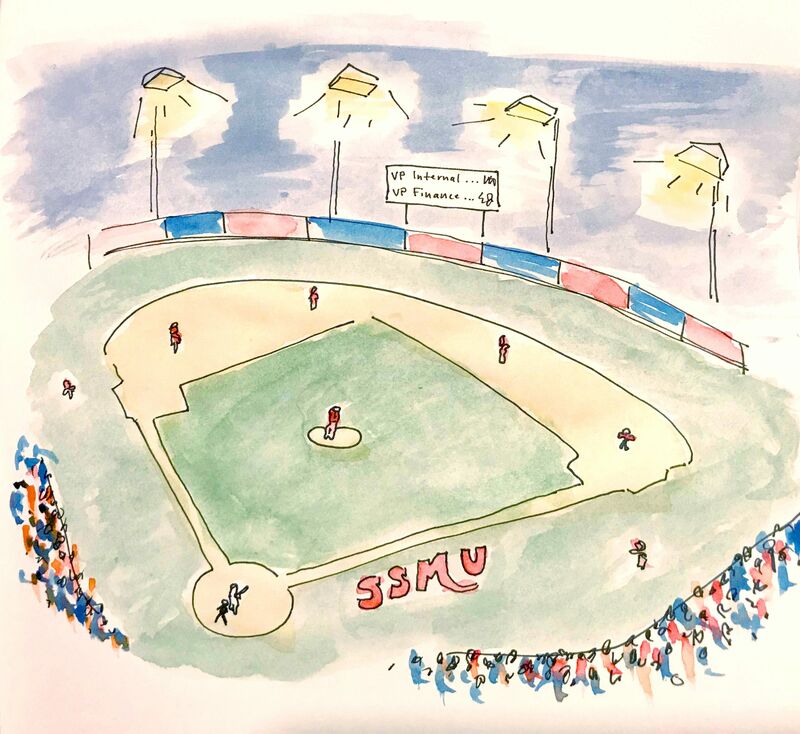 This year the most debated items were the increases to the SSMU Base Fee and the Athletics Facility Improvement Fee, which both failed to pass. Bryan Buraga, whom the Daily endorsed with reservations, won the election for president with 64.6 per cent of the vote. His opponent, Kyle Rubenok, was awarded 35.4 per cent of the votes. 21 per cent of 3,944 total voters abstained from voting for this position. The President acts as the Chief Officer of the society. In this role they are responsible for representing student interests, coordinating with, and supporting, the other executives, in addition to providing a vision for SSMU. Buraga has existing experience in student government and McGill administration, yet prioritizes student input in his work. Some highlights from his platform include the implementation of a fall reading break by 2020, support for McGill’s divestment from fossil fuels, and tougher legislation on teaching staff-student relationships. Sanchi Bhalla won the election for VP Internal with 72.9 per cent of the vote, while her opponent, Aandrianna Jacob, received 27.1 per cent; 31.4 per cent of voters abstained from this position. The VP Internal’s responsibilities include communication, planning campus events (like frosh), and first-year involvement. Neither candidate for VP Internal received an endorsement from the Daily because of their shared lack of experience and meaningful platforms. Bhalla’s platform included provisions for less expensive campus events, more opportunities to gain points for Faculty Olympics over the school year, and other efforts to improve school spirit. Billy Kawasaki, who ran unopposed, won the election for VP Student Life. Kawasaki received 83.3 per cent of the vote, 16.7 per cent voted “no”, and 27.1 per cent abstained. The Daily, taking issue with Kawasaki’s priorities and his history in student government, did not endorse him. Kawasaki briefly served as VP Internal for the Arts Undergraduate Society (AUS), resigning in response to the POLI 339 controversy. The VP Student Life is responsible for the relationships SSMU has with its clubs, services, and Independent Student Groups. They must also take a role in addressing campus issues, promoting mental health, and collaborating with student services. Kawasaki’s main platform point is an online portal for clubs, which would streamline their relationship with SSMU. While this is an ambitious proposal, it is also time consuming and could lead to the neglect of other responsibilities within the VP Student Life portfolio. Adam Gwiazda-Amsel, who ran unopposed, won the election for VP External. Gwiazda-Amsel received 88.1 per cent of the vote, while 11.9 per cent voted “no” and 28.7 per cent abstained. The VP External is responsible for coordinating with different levels of government, in addition to managing affiliations with political causes and mobilization. While Gwiazda- Amsel does not have extensive experience in student government, he does have a good grasp of the VP External’s responsibility. He wants to strengthen McGill’s presence provincially, continue advocacy in the fields of anti-sexual violence, change the R*dmen name, and overall, to prioritize Indigenous voices. Madeline Wilson, whom the Daily endorsed, won the election for VP University Affairs with 69.3 per cent of the vote. Her opponent, Husayn Jamal, received 30.7 per cent of the vote; 25.6 per cent abstained from this position. VP University Affairs is the liaison between student advocacy and McGill governance. They also oversee equity initiatives and policy matters. Wilson, a current Arts Senator, has experience in McGill governance and has proven herself to be a fierce advocate for student interests. Part of her platform includes increasing student involvement in McGill governance through pathways like Senate and student parity on task forces. Sam Haward, who the Daily endorsed, won the position of VP Finance out of three candidates. For this position, the ballot was ranked with Haward in first with 6,526 points. The other two candidates, Ashar Yahya and Ahmed Bawany, received 5,219 and 3,801 points respectively; 34.3 per cent of voters abstained from voting for this position. The VP Finance is tasked with ensuring the society’s administrative security for the short and long term. Haward has the most experience in SSMU governance, including holding a seat on the Finance Committee. Additionally, his extensive platform provided tangible ways to preserve SSMU’s finances, like improving resources for clubs, as well as ways to improve accountability and transparency under the portfolio. The membership fee question in the referenda asked students whether they were willing to accept a 30$ augmentation to the SSMU base fee. If passed, this would raise the fee from 44.33$ to 74.33. However, 52.5 per cent of students voted NO to the item, only 47.5 per cent voted YES and 17.9 per cent of voters abstained. One of the motivators behind the proposed increase was to put us on par with other Canadian student union fees, like Western, whose fee is just over 84$. The fee increase would have allowed for the hiring of more full time staff to provide support within the operations of SSMU, in addition to renovation for student spaces like Gerts. A report released by the 2015-2016 SSMU Academic Research Commissioner found that the fee was low considering the services provided by the society. The last fee increase was in 2007 when 1$ was added. The fee has received criticism from student groups and even some executive candidates for being too steep an increase to implement at once and for having little student input in the decision.